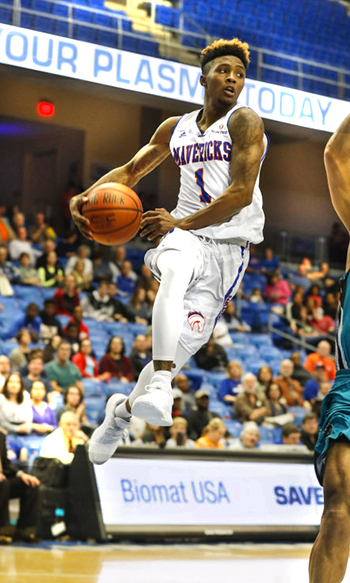 Get your tickets now for the upcoming basketball action at College Park Center featuring the Maverick and Lady Maverick basketball teams, both Sun Belt Conference favorites. WATCH coaches Scott Cross and Krista Gerlich talk about Maverick Pride. The men's team—selected to win the Sun Belt Conference in a preseason poll—is 13-5 on the season and 3-2 against conference competition. The Lady Mavs welcome Louisiana at 7 p.m. Thursday, Jan. 19. The team is 11-4 overall and 4-1 in conference. It's a Blue Out when both the Mavs and Lady Mavs face Louisiana-Monroe Saturday, Jan. 21, with the women's game at 2 p.m. and the men's at 4:30 p.m. The first 250 students receive free blue UTA Solo cups. The men take on Louisiana at 7 p.m. Monday, Jan. 23, for Coaches vs. Cancer night. Use promo code coaches for a buy-one-get-one-free $8 tickets. The first 250 students receive free UTA shoelaces. 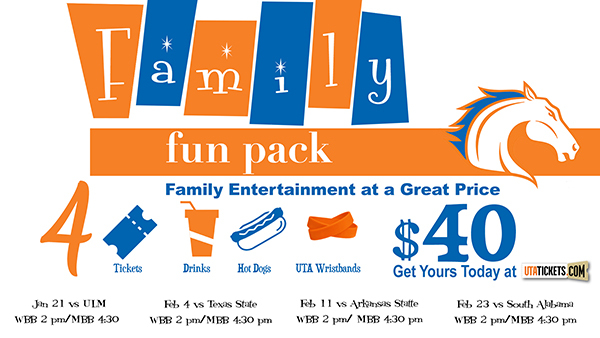 Student tickets are $5 at the UTA Box Office at 817-272-9595 and utatickets.com. LEARN MORE. 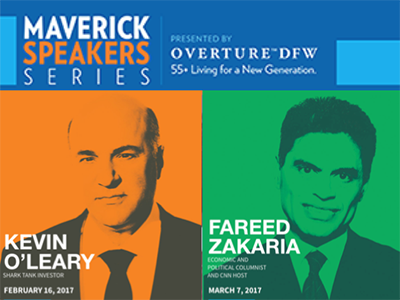 Tickets for the two remaining speakers in the 2016-17 Maverick Speakers Series are now available. Shark Tank's Kevin O'Leary will speak on Thursday, Feb. 16, followed by CNN host Fareed Zakaria on Tuesday, March 7. Both events will be at 7:30 p.m. in College Park Center. VIP packages include a private dinner and photograph with the speaker. Preferred seating has front-of-the-line access to the venue. The lecture is free for students, faculty, and staff and costs $5 for community members. LEARN MORE. 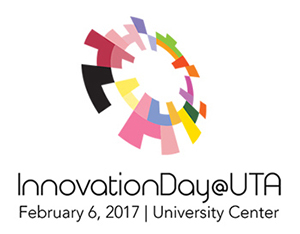 Research success and entrepreneurial excellence are highlights of InnovationDay@UTA, set for Monday, Feb. 6, in the University Center. Students should reserve a spot in the research poster session by Friday, Jan. 20. They also can register for a five-minute Shark Tank-like business pitch by emailing innovationday@uta.edu with a brief description of the company, business model, and value proposition. A three-phase student competition for collegiate and high school teams has a registration deadline of Monday, Jan. 23. LEARN MORE. Student leaders are invited to the annual Partner Breakfast hosted by the Center for Service Learning. The networking event is 8:30-10:30 a.m. Friday, Jan. 27, in the Hospitality Suite of College Park Center. Register online. LEARN MORE. 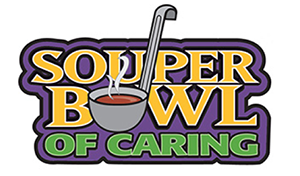 The Souper Bowl of Caring kicks off with a canned food drive 6 a.m.-noon Wednesday, Jan. 18, at the Maverick Activities Center. All donated items will benefit Mission Arlington's food pantry. Stay for the program 9:30-11 a.m. to meet former Dallas Cowboy Drew Pearson and watch high school students compete for the best can-struction design. UTA Bookstore's extra hours for back-to-school needs are 7:30 a.m.-8 p.m. Tuesday-Thursday, Jan. 17-19; 7:30 a.m.-6 p.m. Friday, Jan. 20; and 9 a.m.-5 p.m. Saturday, Jan. 21. Regular spring hours begin Monday, Jan. 23. Mav Express will be open 10 a.m.-2 p.m. Sundays, Jan. 22 and 29. Services offered include making and replacing student/faculty/staff ID cards. The Department of Modern Languages and UTA Libraries have issued a call for papers for the Culture and Society: Bridging the Gap Conference set for Monday-Tuesday, April 10-11. The event brings together students, faculty, and professionals for engaging, multidisciplinary conversations. Submissions are due by Thursday, Feb. 9. Tuesday-Friday, Jan. 17-20—Late registration for spring semester.